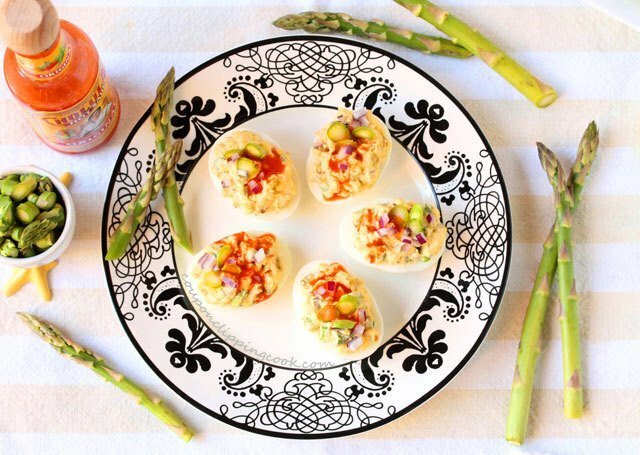 These deviled eggs are so pretty that they look like a decoration for a dinner table or appetizer bar. The vibrant colors from the ingredients and garnishes look so appetizing and appealing that they are almost too pretty to eat. And most importantly, they taste wonderful. 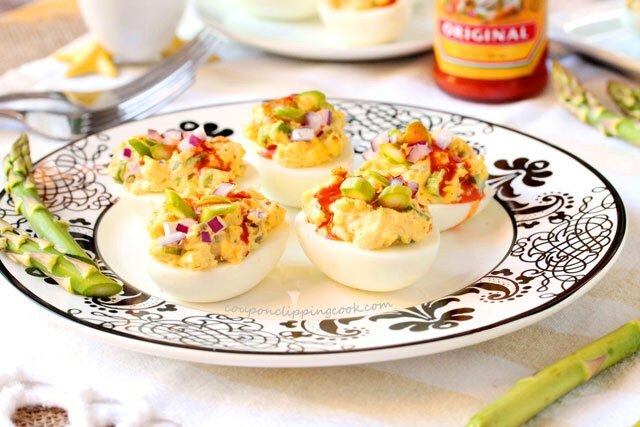 Deviled eggs are great for a quick snack right out of the fridge. 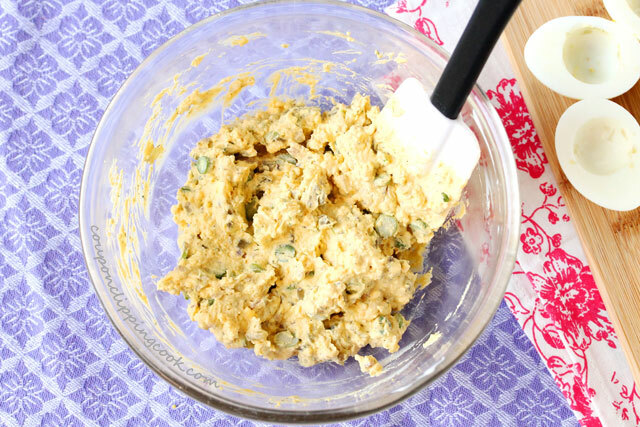 They’re also a tasty finger food for get togethers or even a cool side dish on a hot day. 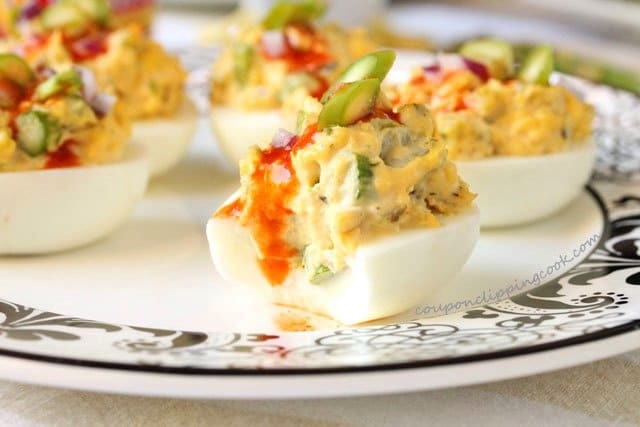 I especially like that deviled eggs can be made ahead of time too. 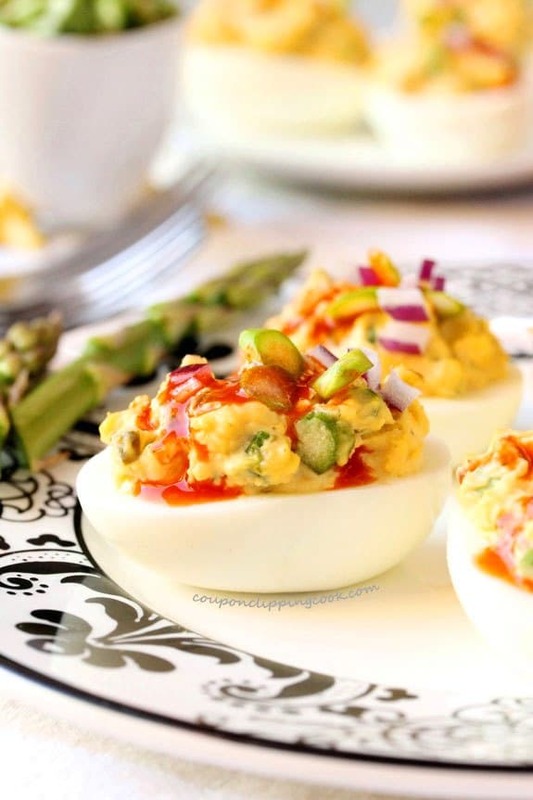 These deviled eggs come with a bonus, a fresh veggie, asparagus. The raw asparagus in these yummies adds a subtle crunch as well as texture and a pretty color. 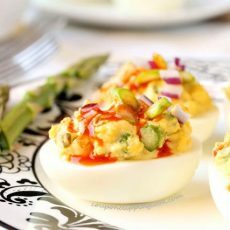 Instead of topping these deviled eggs with paprika which is a traditional garnish, they’re topped with a drizzle of hot sauce which adds a pop of flavor as well as vibrant color. There’s also hot sauce in the filling to add a bit more spiciness to the mix. With a small spoon, scoop out the yolks and add them to a medium size bowl. 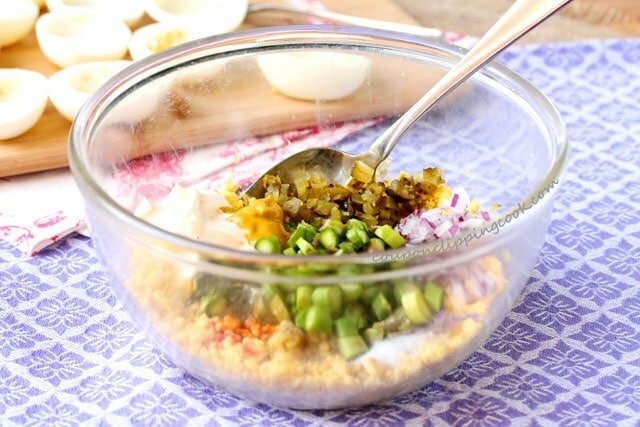 With a fork, mash the yolks into small crumbles. 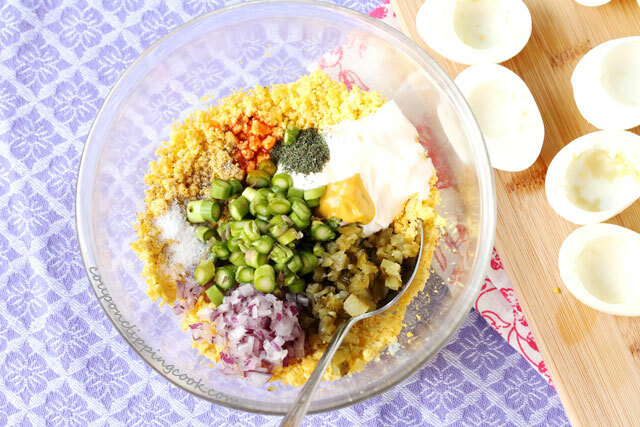 …mix all ingredients together. Do a taste test and add more salt or hot sauce if needed. Salt really makes the flavors pop so an option is to first add the salt to taste and then the hot sauce. Fill the egg whites with the egg yolk mixture. 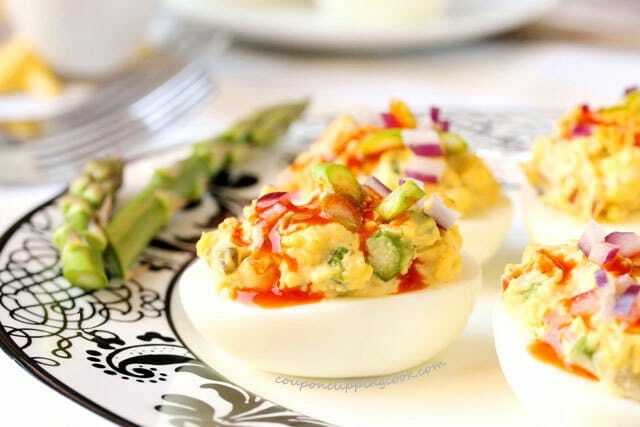 Garnish each deviled egg with a drizzle of hot sauce, slices of asparagus, and diced red onion. 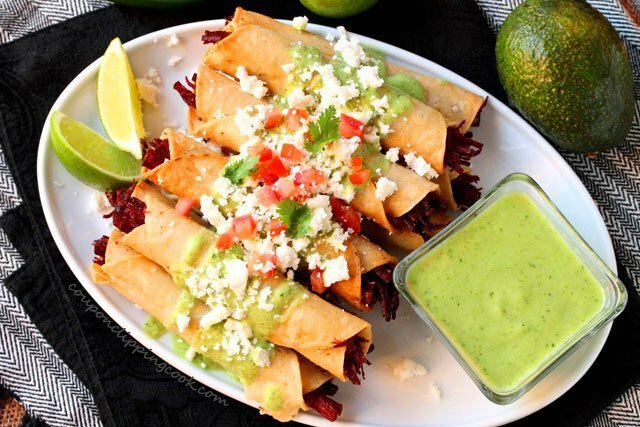 If making these ahead of time, add the hot sauce (for garnish) just before serving. Slice the hard boiled eggs in half lengthwise. 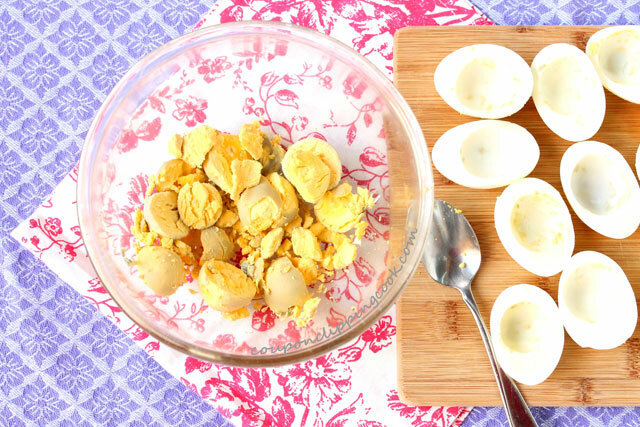 With a small spoon, scoop out the yolks and add them to a medium size bowl. 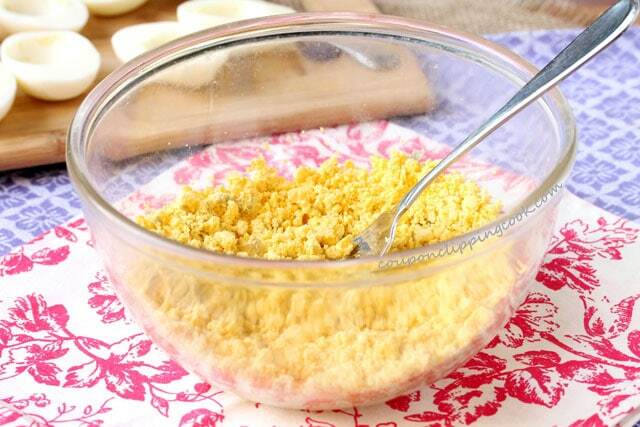 With a fork, mash the yolks into small crumbles. 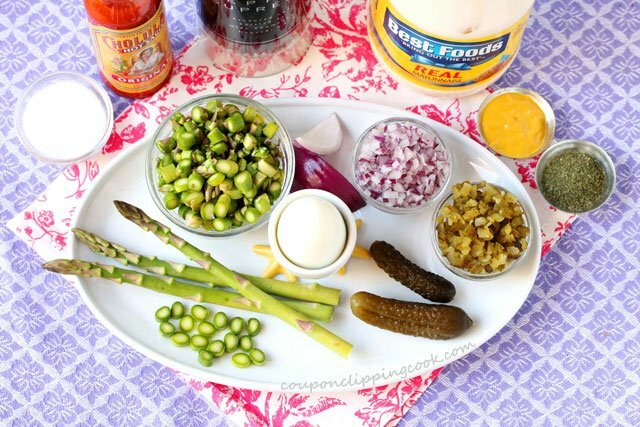 To the bowl, add mayonnaise, mustard, asparagus, red onion, sweet pickles, hot sauce, dill, salt and pepper. Mix all ingredients together. Do a taste test and add more salt or hot sauce if needed. 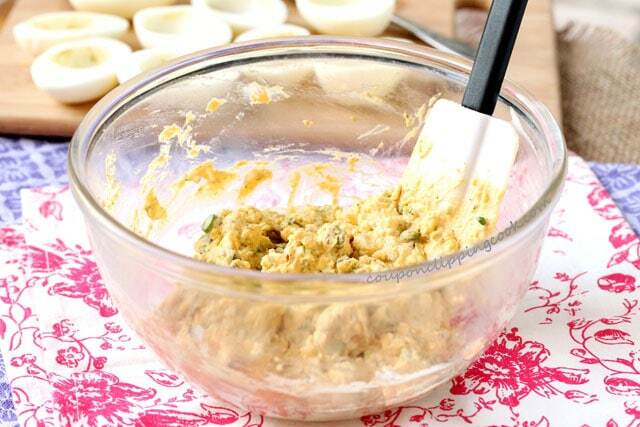 Fill the egg whites with the egg yolk mixture (there should be enough of the egg yolk mixture to form a small "mound" on each deviled egg) .